The HRH Action Cycle illustrates the steps you need to take to apply the HRH Action Framework. 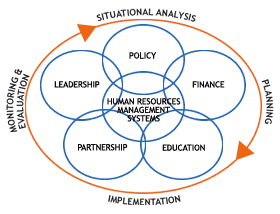 This cycle is adapted to the HRH Action Framework, and pays particular attention to the Critical Success Factors. For example, it is critical that this process is led by an in-country leadership team that represents all of the appropriate stakeholders, i.e., MOH, MOE, MOF, Ministry of Public Services, Professional Associations, and that this team has the strong support of the government and donors. While there are common HR challenges across countries, each country has a unique context. In the situational analysis, it is important to gather all data about staffing shortages and health priorities and project these over the next five to ten years. With this information in hand and with an understanding of the country context, use the six components of the Framework and the key areas of intervention to assess the root causes of the HR crisis in your context. The root causes are generally linked to more than one component, so it is important to consider all components of the Framework. The HRH Action Framework is intended to result in an effective and sustainable workforce. Taking this comprehensive approach requires careful planning. While it is critical to keep the primary goal of a sustainable workforce as the center of the HR strategy, it is useful to develop both short-term emergency priority actions that can be taken along with long-term actions. Using the key findings from the situational analysis above, discuss and develop a recommended strategy and operational plan with the leadership team that includes both long- and short-term actions. Clarify the implementation role of the HRH leadership team as well as responsibilities of other key stakeholders. Develop a roll-out plan and select indicators (see indicators for each component of the HRH Action Framework) for measuring progress and establish appropriate baseline data. As this process will be challenging many entrenched management practices, it is useful to consider the Critical Success Factors in managing change. Establish a routine monitoring process that will provide information on the progress being made on each of the key elements of the HRH strategy. In addition to monitoring and evaluating progress on the content of the plan and providing data to make appropriate revisions, it is also important to monitor the Critical Success Factors as these are ultimately what will guarantee the commitment and support necessary over time to solve this crisis.